TO MAKE A SUCCESSFUL CAREER DECISION? 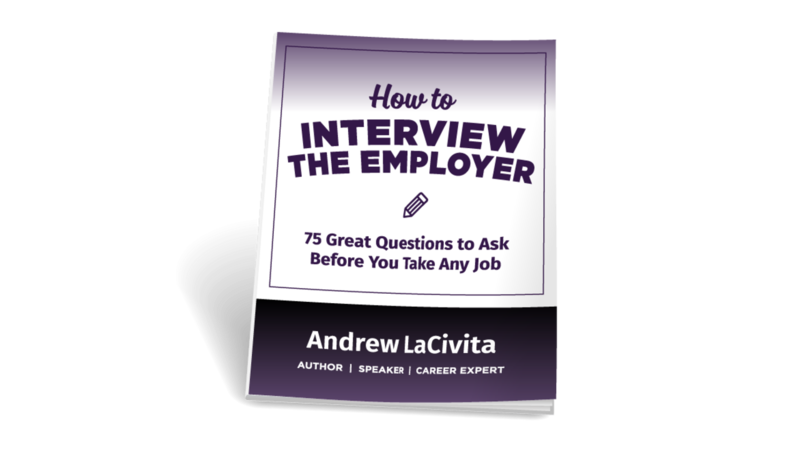 How to Interview the Employer: 75 Great Questions to Ask Before You Take Any Job highlights keys to successfully organization, asking, and using the information from your questions to make the best career decisions. I'm an internally-recognized Executive Recruiter and Founder and CEO of milewalk, a prominent Chicago-based executive search firm. As the award-winning author of The Hiring Prophecies and Interview Intervention, I have spent my nearly three-decade career helping people and companies realize their potential. Over the past decade, I’ve counseled more than two hundred organizations and helps more than five hundred people successfully find new jobs. I’ve captured experience from those endeavors into this very tactical and easy-to-understand job interview guide. This particular guide focuses exclusively on preparing your job interview questions to ask the employer. This targeted approach, along with the guide’s simple format, will make it easier for you to prepare! Understand the importance of asking the right questions to make sound career decisions. Organize your job interview questions in the most ideal manner. Learn the specific sentence structure when asking your questions to ensure you’re not only gathering the information you need, but also selling yourself in the process. Identify seventy-five (75) of the very best questions to ask the employers to ensure you’re gathering all the information you need! WHAT IS IT WORTH TO PERFORM WELL IN YOUR JOB INTERVIEW? I created some of this content five years ago and have been providing it to all milewalk job candidates as they prepare for interviews with our clients (the hiring companies). Recently, I augmented the material to include a much bigger list of specific job interview questions you can use to surface the information you need to know to make great career decisions. Over the past year, I have surveyed more than two hundred of those job candidates regarding what they would have paid for this insight. Mind you, I asked them after they read the content and interviewed for their respective jobs. The average price was slightly over $79. Some of them commented it was difficult to quantify, as they felt more at ease with their decisions because they had so much more information than they otherwise would have without this eBook. They weren’t sure how to quantify their peace of mind. Others remarked they better sold themselves during the job interview because of “how smart” they sounded by asking these questions and “how interested” the employer construed they were in these jobs. I decided to offer this eBook for only $27 because I would rather make How to Interview the Employer available to as many people as possible at an affordable price. I hope you take me up on this offer while the price remains low! Don't miss this chance to learn everything you need to know about how to ask your questions in a job interview!